Sticky, sweet and very shareable, this chicken dish really is hard to resist. Just keep basting and turning your chicken (huli means to turn) for the ultimate Hawaiian feast. To Garnish – 1 Small Pineapple, cut into 8 wedges. To start brush the pineapple wedges lightly with 1 tbsp of oil and cook in a very hot griddle pan for 3-4 minutes on each side. Set aside 2 tbsp of the Huli Huli Paste for the Sunshine Slaw. Now mix the chicken with 1 tbsp of oil and place in a pre-heated griddle pan. Turn the chicken every minute or so, brushing liberally with the remaining Huli Huli Paste every time it’s turned. Cook for 10-12 minutes until chicken is cooked. 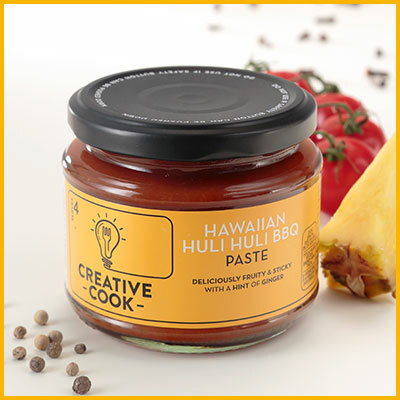 Toss all the sliced vegetables in a bowl with 2 tbsp of the Huli Huli Paste to make the Sunshine Slaw. Serve the chicken, slaw and pineapple on a sharing dish, alongside some potato wedges on the side and then let everyone pile in. Shredding the chicken and serving in warm brioche buns with the sunshine slaw for a delicious finger licking treat. Marinating pieces of courgette, red onion, peppers, halloumi and whole cherry tomatoes for 30 minutes in Huli Huli Paste. Thread onto a skewer and then grill or BBQ.